Stop throwing money out with your trash! 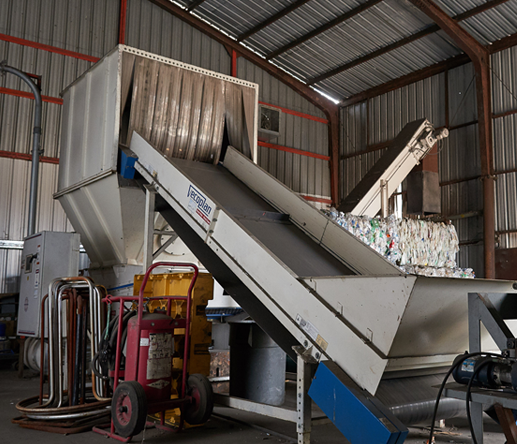 Your business needs a smart recycling program, one that finds cost-effective ways to dispose of your recyclables and even generates revenue. We live, sleep and dream recycling. We know the questions to ask you and the programs to activate that will help you get the most out of your recycling program. The first step is a consultation with our professional staff. From there we’ll advise you on your best course of action. Finally, we’ll roll our sleeves up and help you put your custom recycling plan into action. Our friendly and knowledgeable staff is ready to help you figure out the right recycling solution for your business. We have a fleet of trucks that can supply you with recycling bins and then pick them up with your recyclable waste. We can help you determine how many recycling bins you require and we’ll keep that number on hand for you to use, free of charge. What about shredding and secure disposal? We have one of the largest shredders in the state of California. Our off-site document destruction program addresses today’s need for the proper disposal of your company’s documents for both privacy and security. We can help with your product destruction. Do you have a room full of products with imperfections, damaged goods or rejected materials? Our product destruction program gets rid of these unwanted materials and outdated electronic products. Our trucks will collect your unwanted waste and dispose of it properly, safely and responsibly. We can even provide you with a certificate of destruction. 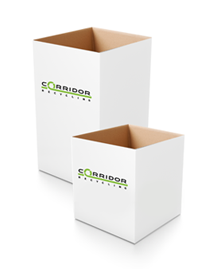 Collection containers run the gamut in size, from convenient desk-side boxes to industrial bins for the warehouse. Let us help you decide which containers—and how many—are best for you. 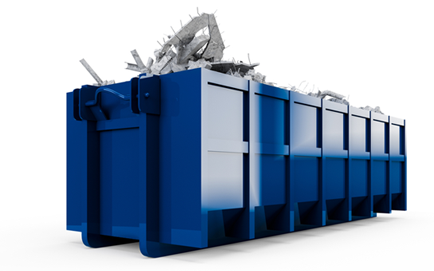 This roll-off 3-yard bin is perfect for tight building sites where space is at a premium. They are rollable and lockable too! 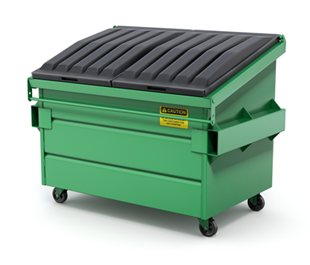 When there’s a waste from a construction or renovation, or from any large project, the 40-yard bin is the way to go. This is a standard size for in office recycling applications, and can be placed desk-side or next to a copy machine. We have the right equipment for you. Ever wanted your own baler? We can help you with that. Vertical balers, horizontal balers and compactors, we’ll help you determine which equipment is right for you, install it and even train your staff how to operate it. 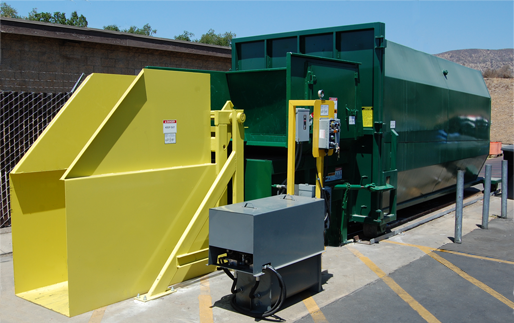 Recycling equipment can be purchased or leased with a purchase contract. 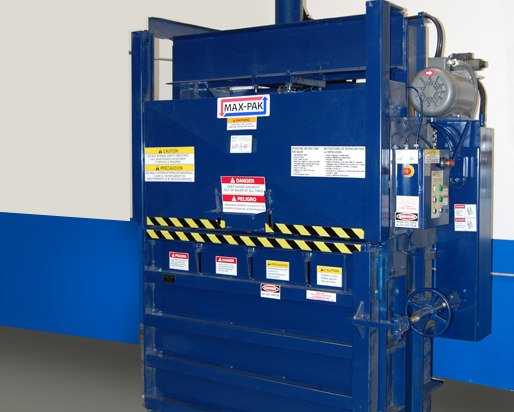 With a smaller footprint requiring less floor space, vertical balers are better for smaller facilities. 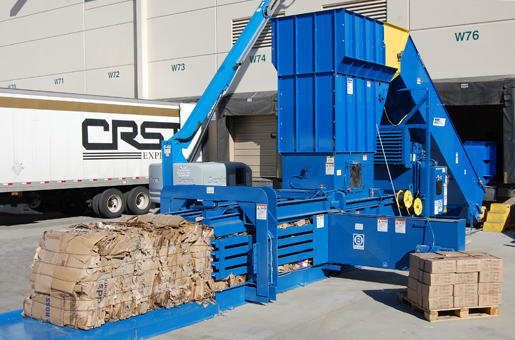 Perfect for handling higher volumes of recyclables, horizontal balers make a denser bale, and can run automatically without constant monitoring! Typically used for cardboard and mixed paper, compactors come in all sizes.